So I was officially on the hook for making laundry detergent myself, lest the dirty laundry start to pile up. And we’re potty training Lillia these days, so we’re talking major laundry. I found this recipe by Trent at The Simple Dollar, which I planned on doubling*. Seems simple enough, and we already have all but one ingredient: washing soda. Luckily, I found out from Penniless Parenting that you can make washing soda from baking soda. It’s as simple as 2NaHCO3 —> Na2CO3 + CO2 + H2O. Or “bake it for a while at 400” for the non-nerds. But how long to bake it? The blogger at Penniless Parenting is strangely mum never timed it, so I don’t know how long it takes to turn baking soda into washing soda. I timed it while mine was cooking and I found that it takes a little over an hour to turn 2 cups of baking soda into washing soda at 400 degrees. 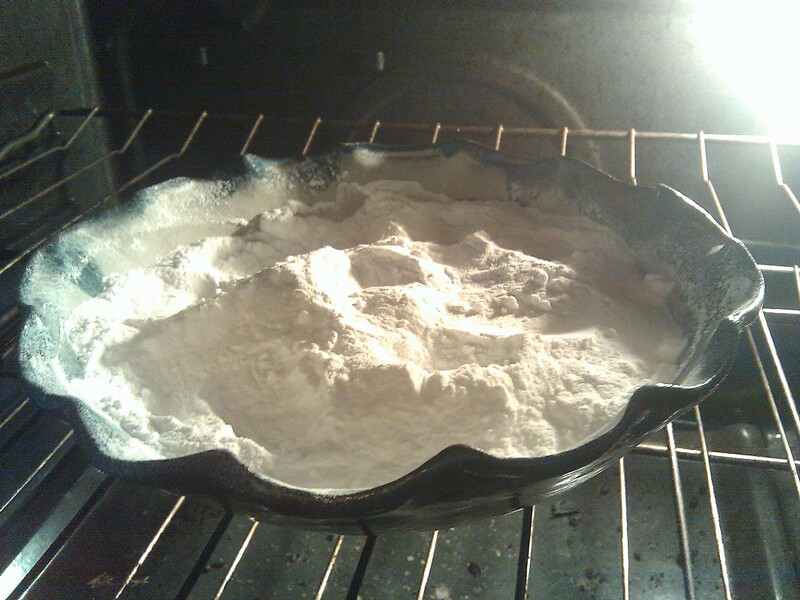 I put it in an oven-safe pie plate and stirred it every 15 minutes or so. While that was baking, I’d like to tell you that I was grating the soap since that would have been a sensible thing to do. But that would be a lie, because I was actually hanging out with Venessa. 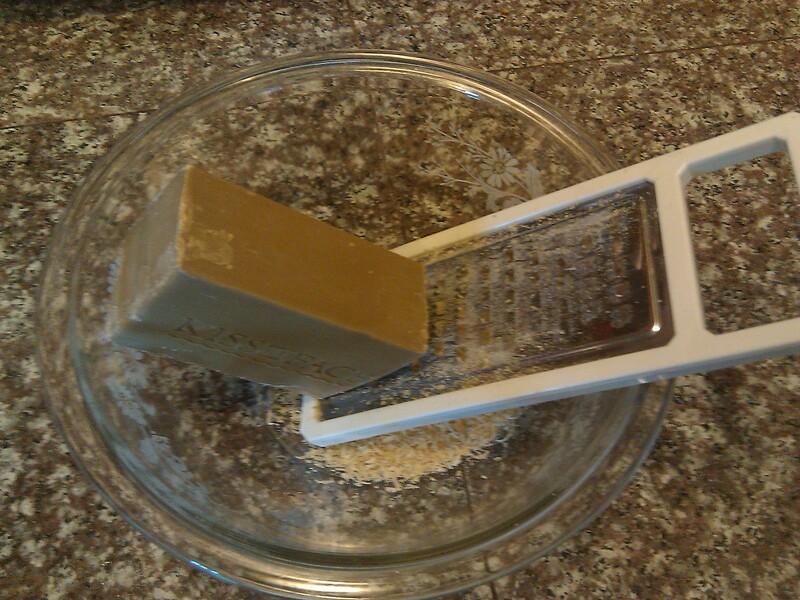 I grated the soap later, and put all the ingredients together. This was actually the worst part, unless you enjoy borax and washing soda in your nose, throat, and lungs. Personally I don’t. I guess this is how cocaine addicts feel, with all the dripping and the white powder. Trent claims that making laundry detergent saves him $37 a year vs. generic powder. We use Trader Joe’s powder which is $10 for 64 loads, or $0.16 per load. I estimate the batch I made took about 30 minutes to make, and made about 48 loads at a cost of about $0.05 per load. 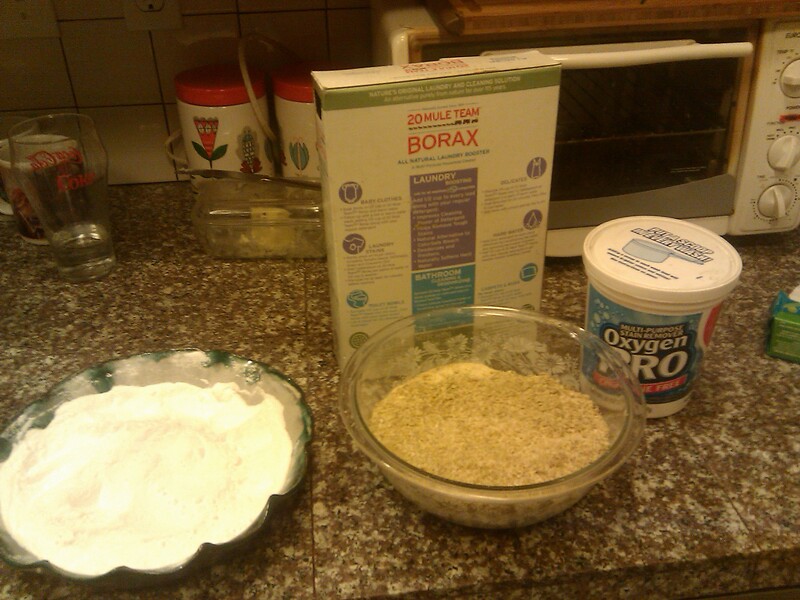 We do about 200 loads of laundry a year, so I’m saving about $22 a year for 2 hours worth of work (4 batches), or $11 an hour and 4 facefulls of borax. In conclusion: not worth it. PS: The lady with 19 kids has a recipe for liquid laundry detergent that looks like it’s worth trying. Update: I tried the liquid recipe mentioned above, and it’s pretty good! Social Experiment – How would you spend $1000? A comparison of spending in 1949 versus 2011. You’re automatically saving away money each month, right? It might not be much, but the act of saving is more important than the amount. If you’re not saving, stop reading this and go set up an “Automatic Savings Plan” between your checking account and a savings account. Even if it’s $1, just go do it. OK, now that we’re all saving, let’s get down to my favorite step of this entire book: visually tracking your path to a day when you no longer need paid employment*. Remember that chart we made in Step 5? If not, it’s my fault for not posting this book review quickly enough. But if so, pull it off the wall or load it up on your computer, because we’re about to add an AWESOME new line to it. This new line is your monthly “investment income,” the money you’d live off if you didn’t have paid employment. Sounds like something only filthy-rich people can do, but I’m about to show you how everyone can have investment income, and how eventually it will be enough to sustain you. Where “capital” is a fancy word for “how much money you’ve saved,” and long-term interest rate can be found here. Having bored you with that math, a short-cut to finding your “investment income” is to replace the long-term interest rate with a flat rate of 4%, generally considered a “safe” amount to draw from one’s capital while still preserving the capital itself. So each month when you plot the new points for “income” and “expenses”, add a 3rd point for “investment income” using one of the two formulas described above. After doing the previous steps for a few months, your total monthly expense line should be a little lower and your income line should be a little higher. And when you start plotting the third line, it’ll be a little blip down at the bottom, for now. But eventually, thanks to your diligence and compound interest, you’ll reach a crossover point where your investment income is more than your monthly expenses. It might take a while, but it’ll happen. It’s inspiring to literally see that you only need to work for pay for a finite period of time. At the Crossover Point you will be financially independent. How long will it take? Depends on what percentage of your take-home pay goes into savings. Also known as your “savings rate”. At the bottom of this blog post by Mr. Money Mustache is a little chart that should help you estimate when you’ll hit the crossover point. Depressing Spoiler Alert: if you’re saving less than 25% of your take-home pay, it’s gonna be a while. But don’t let that deter you from saving what you can. If you follow the steps of this book, you’ll find some extra change under the proverbial couch cushions of your life more frequently then you think. Maybe it’s only 1% or even only $1 this month, but if you consciously work towards a goal of increasing your savings rate, while reducing spending, I guarantee you’ll see that “monthly investment income” line soaring up towards the crossover point. * Many people call that “retirement” but I think the term is too confining. It really means you have a choice whether or not you have paid employment, and I’m sure it’s awesome. I’ll let you know when I find out about it first-hand. Compared to a night out at a bar, a BYOB party at home with friends is a very frugal way to let loose and have some fun. You get to pick the guests, the drinks, and the music. Better yet, if you host, you don’t need a designated driver to get home! Today is World Party Day, so to celebrate, some friends and I concocted a special drink to celebrate. Meet the Whirled Party Drink. Enjoy! Benjamin Franklin rose from 17-year-old runaway to successful printer, newspaperman, author, inventor, diplomat, and statesman. His great success came from living the virtues of frugality and industry, and his life offers us many personal finance lessons that apply to modern men just as much as they did to those living in colonial America. Check out 8 money lessons from Benny-F.